The girls of Mark Keppel have an effective response to their team’s unthinkable off-season turmoil: winning. A lot. Senior guard Sydne Kaku has helped lead Mark Keppel’s girls rebound from off-season upheaval to a season that has them unbeaten in the Almont League and headed for the playoffs. It’s the kind of tabloid fodder you never, ever, want to be involved with your team. A scandal involving coaches and players and inappropri­ate relationships. That, however, is precisely what faces the Mark Keppel High girls basketball team during the offsea­son, and the fallout has been noth­ing short of a complete dismantling of one of the area’s premier prep basketball programs. 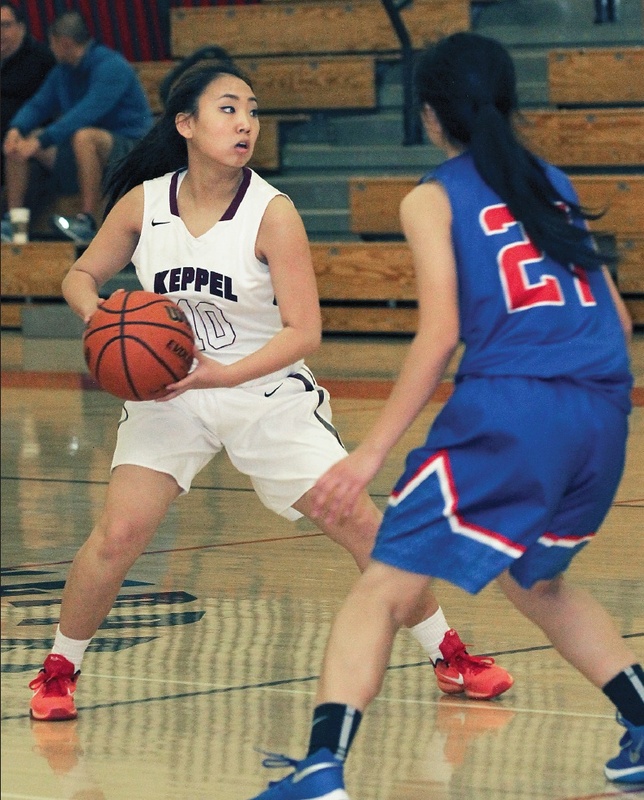 “It was a little bumpy at first,” said Keppel senior guard Sydne Kaku, following the team’s 63-40 win this week over San Gabriel. The weak points haven’t been showing much lately. The Lady Aztecs are marching toward the playoffs with a record of 16-7 overall, and at 7-0 in the Almont League, they’re on track for their sixth straight unbeaten year in con­ference games. Last year, they went all the way to the State finals. After last season, Keppel was looking at some hard choices, with four of their five starters gradu­ating. The team was looking to build around high-scoring forward Sophia Song, a sound strategy for a team that had constructed a solid program with a pipeline of under­class talent. It was a shock out of the strato­sphere for some, no surprise for others, and it might end with a day of reckoning for at least one. In September, head coach Joe Kikuchi, credited with crafting the Keppel program into an area powerhouse, abruptly resigned. Days later, he was arrested and charged with carrying on a sexual relationship with one of his under­aged players. The next pre-trial hearing in his case comes up later this month. The school and the district wast­ed no time of purging themselves of any connection to the scandal. Kep­pel’s principal and vice principal were placed on leave and ultimately reassigned to other locations within the district. All of Kikuchi’s assistant coach­es, including talented Keppel alum and former Cal State Bakersfield star Krista Arase, are also gone. The unenviable task of taking the reins of the shattered program fell to former South El Monte High skipper Jose Herrera, known to several of the players and par­ents through his coaching of club teams. Herrera said the grueling early schedule helped his girls cut their teeth right out of the gate, exposing them to the kind of competition they’ll face in the playoffs. The mood at Keppel’s home games is unmistakably altered. The crowds have been smaller, quieter, perhaps still in shock over the offseason turmoil. But the team’s performance has spoken volumes about their resiliency and their continued ability to play some great basketball.